Free wedding announcement templates are fast, fun, and easy to personalize. Free wedding announcement templates from Smilebox serve many purposes. Friends and relatives have been waiting for this important news, and wedding announcement templates are a wonderful way to inform them. If you have a date already, the wedding announcement maker can act as a notice. Additionally, upon receiving your customized wedding announcement template, friends and relatives might start the shower of gifts to celebrate your new life together. Wedding announcement maker from Smilebox is one of the first things you’ll use in building up to the big day. Our variety of free wedding announcement templates might give you some ideas about the style you want for the rest of the messages that you send to family and friends. Once you pick the wedding announcement template this time around, you may want to keep that look for everything else going forward. That’s even truer considering all of the ways that you can personalize a Smilebox wedding announcement template. Use your favorite photos, write some flowery messages, and experiment with colors to get the perfect wedding announcement template. All of this can be done quickly and with no technical skills--see below to find out how. 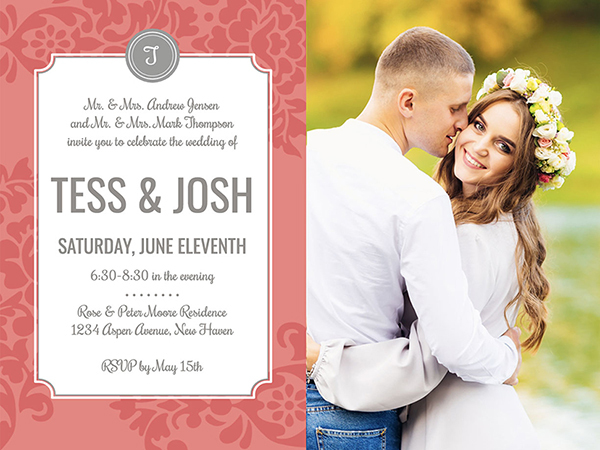 Wedding announcement templates are available in a myriad of styles from which to choose. Find the one you like best, and then click it and on “Personalize”. Free wedding announcement templates have different arrangements, some with one place for a photo, and others with several. You can fill the spots by clicking “Add More Photos” in the wedding announcement maker. This will allow you to search for images you have stored on your computer, social media accounts, and phone. Wedding announcement maker enables you to change pretty much every aspect of the free wedding announcement template. Each piece of text can be altered to accommodate your message, while you can also try different combinations of colors and fonts. Once you have checked the details that you entered into the wedding announcement template, you can share it with friends and family. For immediate delivery, the wedding announcement maker lets you send your creation by email and social media post. You can also have your customized free wedding announcement template printed in glorious color and sent by regular mail. When you plan a wedding, there’s a lot to do. That’s why using our free wedding announcement template is such an advantage. Broadcast your exact feelings by using a thoughtful image and carefully worded text. The tone provided by our wedding announcement templates puts all of your feelings together on one well-designed page. Free wedding announcement templates can be customized quickly and precisely. The wedding announcement maker has been designed by Smilebox for user friendliness. All tools for changing your free wedding announcement template are on one screen of the platform. Similarly, all the controls in the wedding announcement maker are intuitive. Wedding announcement maker looks simple but actually can provide some very complex functions. All it takes is a few clicks to include animation and music files on your wedding announcement template. The photo pane of the wedding announcement maker allows you to experiment with various images in several spots. In addition, any changes that you make to your design are instantly updated by the wedding announcement maker. Free wedding announcement templates also deliver multiple sharing options. The final version of a Smilebox free wedding announcement template is high resolution.